Add the first 7 ingredients into the bowl of an electric mixer fitted with the whisk attachment. Turn the mixer on low. Once the ingredients are incorporated, turn the mixer on high and whisk until the cream forms stiff peaks. Arrange a layer of cookies in the bottom of an 8-inch springform pan. Break some cookies to fill in any spaces. Add a fifth of the whipped cream evenly over the layer of cookies. 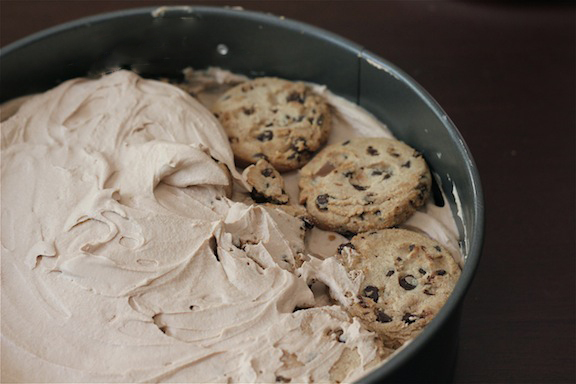 Add a layer of cookies on top of the cream, followed by another layer of cream. Continue layering, ending with the cream. Smooth the top with a butter knife or offset spatula. Cover it with plastic wrap and chill in the refrigerator overnight. 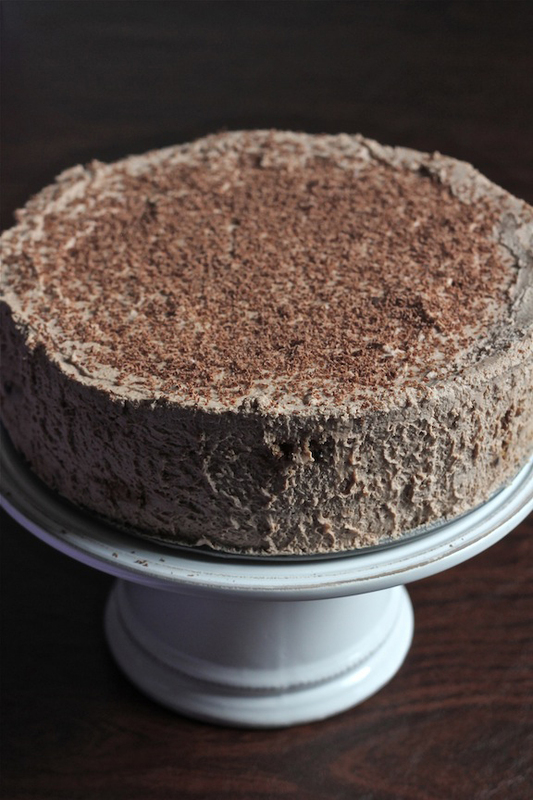 Before serving, run a small knife around the sides of the pan, sprinkle the top with chocolate and serve cold. How simple is that?? We were engaged in good girl talk when we ate this so I forgot to take photos of the inside, but I do have a few comments about it. The recipe says you should have five layers of each, but I only had three layers of each. My cookies were a little thick, so use thin cookies if you want five layers. Oh, one more thing. This cake is RICH! So have a glass of milk on the side for sure! Oh my gosh! This looks so so good!! Your cake was sinfully delicious Tiffany! That mocha whipped cream... YUM. It was good seeing you Saturday! You're killing me with this one!!! I am so impressed with your pics, did you say that you got a new camera? This looks incredible! Bookmarking the recipe now! Game nights is always fun at my cousins. I wish we would do that more often. Toss in some alcoholic drinks and it's on and popping! Wow looks SOOO good! You slay me with these pictures and recipes..I mean how can I not oblige and make this???? Oh my goodness, Tiff, you're killing me with these recipes!! This looks heavenly. I like that hidden cookies!